Real Madrid struggled to beat Malaga by 0-1, but managed to get through to the Copa del Rey quarter-finals, where an exciting match-up against Barcelona is the most likely scenario. Karim Benzema scored the winning goal of the night, from a big mistake by Malaga's goalkeeper. Real Madrid schedule this season prevented the Merengues from attending the yearly FIFA Balon d'Or gala 2011, but José Mourinho men made sure they wouldn't be missing the Copa del Rey quarter-finals, which will most likely put them against their eternal rivals, Barcelona. Real Madrid pulled off a tough 0-1 win against Malaga, getting past Manuel Pellegrini's side with 4-2 overall result, when combining the two legs. Karim Benzema scored the winning goal already during the 2nd half and Cristiano Ronaldo, who played the full 90 minutes, lacked a bit of the inspiration he has been showning for so many times over this season. With a 1 goal cushion obtained last week at the Santiago Bernabéu (3-2 win), Real Madrid was well aware of how dangerous this match against Malaga could turn out to be. All it would take to get the Merengues out of the picture was a 1-0 win, so both José Mourinho and Pellegrini knew they had a patience game ahead of them, as the two teams collided in the "La Rosaleda". José Mourinho decided to go into this match by making a few changes in the way the team usually approaches their games. With Di María still sidelined and not available to help, Real Madrid line-up included Cristiano Ronaldo and Gonzalo Higuaín upfront, with a 4-men midfield composed with Xabi Alonso, Khedira, Diarra and Kaká. The big difference as many can immediatly note, is the slight change from a classic 4-3-3 into a not less classic 4-4-2, with its own variations induced by Mourinho. However, coincidentally or not, attacking-wise Real Madrid had one of the most poor performances of the season, struggling a lot to create good goalscoring chances. The first half wasn't exactly what we can call a treat for the eyes, as a harmless Real Madrid side failed to impose a strong and fast rhythm, while Malaga only managed to put Iker Casillas into trouble for a few occasions, most of them by taking advantage of a Portuguese player speed, Eliseu. As half-time reached, the goalless scoreline was still granting the edge to Real Madrid, but a single goal could turn everything upside down. Sami Khedira picked an injury close to the end of the 1st half and Mourinho sent in Mesut Ozil to take his place. However, the Portuguese coach felt there was something else needing to be retouched and also replaced Kaká with Marcelo, allowing Fábio Coentrão to take a more attacking role in the game, by playing him as a winger. The game soon started to speed up and both Malaga and Real Madrid were finally getting good chances to score. Near the 63th minute, Cristiano Ronaldo had a great opportunity to make his 27th goal of the season, but the Portuguese header got stopped by a great save made by the Argentinian goalkeeper, Caballero. However, and as seen many times in this sport, close to the 72th minute the hero became the villain as the same Caballero made a tremendous error when attempting to stop a weak strike from Benzema and let the ball slide between his own legs. Real Madrid knew that from that point on, only a big succession of errors would allow Malaga to keep their hopes of getting through alive, as Pellegrini's side now needed to score 2 goals to get past the Merengues. However, there wouldn't be more surprises reserved for this match and José Mourinho men controlled the game until the end, without suffering any more upsets, except for Arbeloa. The Spanish defender got shown a 2nd yellow card and a respective red card, after elbowing an opponent in a jump to head a ball in the air. By getting their ticket to the Copa del Rey quarter-finals, Real Madrid are now waiting for the confirmation on their next opponent, who will most likely be Barcelona. The Blaugrana will face Osasuna this Thursday for their 2nd leg match, but they already got a 4-0 lead advantage obtained last week. The Copa del Rey quarter-finals draw has already been made and Barcelona is about to stumble in the way! The quarter final "Clasicos" will be disputed in two legs, set to be played in the 17th and 24th of January 2012. Real Madrid next game is against Mallorca for the Spanish League "La Liga", in the 14th of January 2012. You can watch Juventus live stream, Manchester City vs Liverpool, as well as Tottenham vs Everton and Osasuna vs Barcelona from our soccer live streams section. 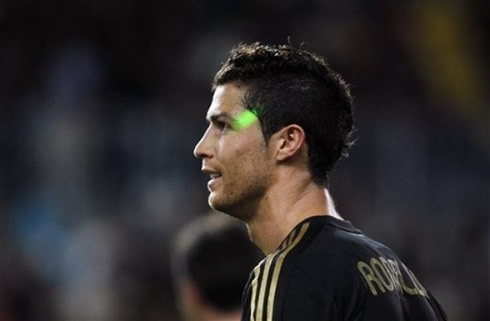 Cristiano Ronaldo is expected to be on the line-up against Mallorca this weekend.